Solid waste management situation in Pakistan is a matter of grave concern as more than 5 million people to die each year due to waste-related diseases. In Pakistan roughly 20 million tons of solid waste is generated annually, with annual growth rate of about 2.4 percent. Karachi, largest city in the country, generates more than 9,000 tons of municipal waste daily. All major cities, be it Islamabad, Lahore or Peshawar, are facing enormous challenges in tackling the problem of urban waste. The root factors for the worsening garbage problem in Pakistan are lack of urban planning, outdated infrastructure, lack of public awareness and endemic corruption. There are no controlled sanitary landfill sites. Opening burning is common. As a result of these problems, waste is accumulating and building up on roadsides, canals, and other common areas and burning trash is common, causing hazardous toxins to be exposed thereby threatening human and environmental health. Among the already few landfill sites that are present, even fewer are in operation. Even within Pakistan’s capital, Islamabad, there are no permanent landfills to be found. The waste on the roads allows for an ideal environment for various flies to thrive which effects both human health and the health of the environment for other species. 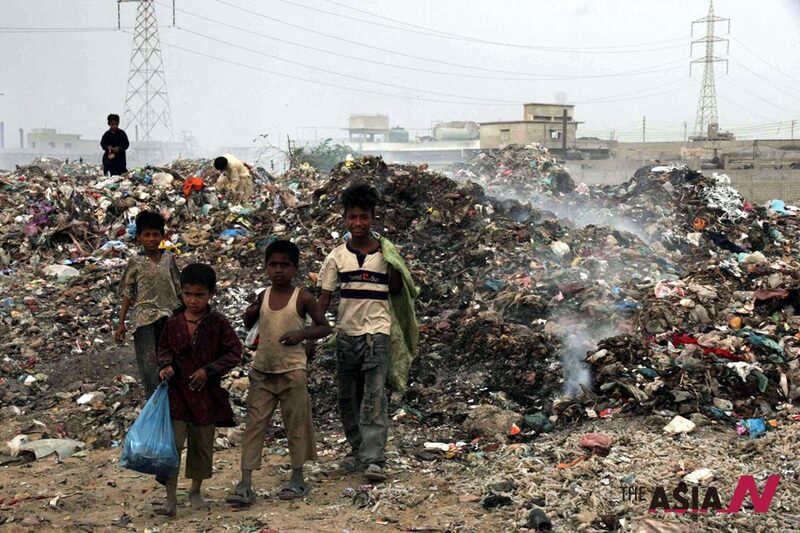 The poor solid waste management in Pakistan has caused numerous diseases and environmental problems to rise. In Lahore, the capital of Punjab and the second largest city in Pakistan, there are currently no controlled waste disposal facilities are formal recycling systems, though roughly 27% of waste (by weight) is recycled through the informal sector, Lahore does not have very high performing governmental management in the waste management situation. Instead, the City District Government Lahore established the Lahore Waste Management Company and left the responsibility of the Solid Waste Management in Lahore to them. Beginning in 2011, Lahore Waste Management Company strives to develop a system of SWM that ensures productive collection, recovery, transportation, treatment and disposal of the waste in Lahore. Lahore Waste Management Company (LWMC) has over 10,000 field workers involved in waste collection and disposal. Though the LWMC is working in phases, 100% collection rates are not seen yet. Lahore currently only has three disposal sites which are no more than dumps, where illegal dumping and trash burning is common. However, there is some resource recovery taking place. It is estimated that 27% of dry recyclables are informally recycled within the city. Additionally a composting plant converts 8% of waste into compost. In general, the governance over the Waste Management in Lahore is hardly present. Though there are current projects and plans taking place, by the Lahore Waste Management Company for example, in order to achieve a productive and sustainable system in the city it is necessary for all service providers (formal, private, and informal) to take part in decisions and actions. Solid Waste Management Guidelines (draft) prepared with the support of Japan International Cooperation Agency (JICA), Japan. Converting waste agricultural biomass into energy/ material source – project by UNEP, IETC Japan. The URBAN UNIT, Urban Sector Policy & Management Unit P & D Department, Punjab. Conducting different seminars on awareness of waste water, sanitation & solid waste management etc. Lahore Compost (Pvt.) Ltd. only dealing with the organic waste with the cooperation of city district government Lahore, Pakistan. The company is registered as a CDM project with UNFCCC. Different NGOs are involved at small scale for solid waste collection, and recycling. Additionally, in November 2013 a German company, agreed to invest in the installation of a 100 megawatt power plant which generates energy from waste from Lahore. Progress is being made on the country’s first scientific waste disposal site in Lakhodair. With this in mind, the Lahore Waste Management Company considered other possible technologies for their Waste-to-Energy project. They opened up applications for international companies to hire as the official consultant for LWMC and their project. The results of the feasibility study results showed that the power plant has the potential to process 1035 tons of municipal waste daily, and generate 5.50 megawatt electricity daily. Although SWM policies do exist, the levels at which they are implemented and enforced lack as a result of the governmental institutions lacking resources and equipment. These institutions are primarily led by public sector workers and politicians who are not necessarily the most informed on waste management. For improvements in municipal solid waste management, it is necessary for experts to become involved and assist in the environmental governance. Due to the multiple factors contributing to the solid waste accumulation, the problem has become so large it is beyond the capacity of municipalities. The former director of the Pakistan Council of Scientific and Industrial Research, Dr. Mirza Arshad Ali Beg, stated, “The highly mismanaged municipal solid waste disposal system in Pakistan cannot be attributed to the absence of an appropriate technology for disposal but to the fact that the system has a lot of responsibility but no authority.” Laws and enforcement need to be revised and implemented. The responsibility for future change is in the hands of both the government, and the citizens. Waste practices in the Pakistan need to be improved. This can start with awareness to the public of the health and environment impacts that dumped and exposed waste causes. It is imperative for the greater public to become environmentally educated, have a change in attitude and take action.